NRATV host carried a gun in public, despite admitting he "could not hit water if I fell out of a boat"
Grant Stinchfield, the host of a news program for the National Rifle Association’s media operation NRATV, made on-air comments that he was “embarrassed” by how poor a shot he was until he recently participated in an NRA training and insurance program. Previously, Stinchfield had repeatedly talked about carrying a gun in public wherever it was legal to do so while encouraging others to do the same. Stinchfield’s admissions undermine the NRA claim that permissive concealed carry laws are a benefit to public safety and highlight how these laws often allow poorly trained people to carry guns in public. 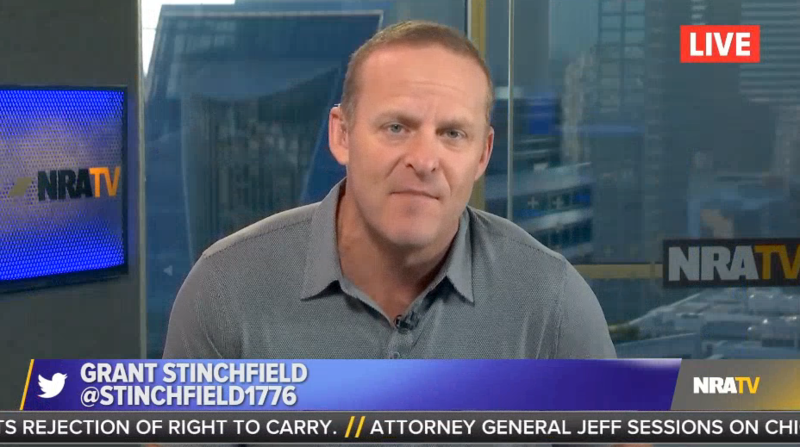 During the January 2 edition of NRATV’s news show Stinchfield, Stinchfield said his News Year’s resolution is to “always be carrying because I got lackadaisical at times last year about carrying my gun with me. If you don’t have it with you, it’s not going to do you any good.” Over the next weekend, Stinchfield took part in the NRA Carry Guard gun training program. Launched in 2017, NRA Carry Guard sells gun trainings and insurance policies packages. Policyholders are able to recover costs associated with shooting someone under some circumstances, including legal and “clean-up” expenses. DANA LOESCH: So Grant, what did you think of Carry Guard training? GRANT STINCHFIELD (HOST): So you had to told me to be prepared that they were going to yell at me, and they were going to make me -- and guess what? LOESCH: No no no, hold up, hold up. You are being so dramatic about this. I just said that during some of the drills they’re going to yell, that’s all. GRANT STINCHFIELD: All right, well they did yell during the drills. So, but meanwhile, so me, because I am very dramatic about things, I’m waiting to just get attacked with a verbal barrage and so the whole time I’m thinking that this is going to be what happens, and it never happened. [...] And the first day, I’m embarrassed to say, I had a real hard time hitting the target, I was low and right on everything, from gripping down on my right hand and maybe just the stress of it all. By the third day, I finished tied for second in my shooting test. The NRATV host also interviewed his Carry Guard instructors and admitted to them that during the first day of training, “I could not hit water if I fell out of a boat.” When he asked the trainers whether they were “worried about me even coming close to passing this course,” one of them replied, “I honestly thought you would shoot a little bit better when we first started,” before saying that Stinchfield improved throughout the training. Despite having difficulty hitting his targets during the training earlier this month, Stinchfield previously said during a November NRATV broadcast that said he carries his firearm “everywhere I am legally allowed to”, and has repeatedly maintained that concealed carry holders “make everyone around them so much safer,” even in states that have repealed requirements to obtain a permit before carrying a gun in public. It is very worrisome that the NRATV host, who claims to carry wherever he is legally allowed to, was admittedly such a bad shot before taking a voluntary three-day training program. The state of Texas, where Stinchfield is based, only mandates between four and six hours of in-person or online instruction to obtain concealed carry. The range component of the training only requires the applicant to shoot a total of 50 rounds at three different distances. Research into the impact of allowing people to carry guns in public has demonstrated that these policies are actually associated with increases in crime, particularly aggravated assault. While NRA markets its Carry Guard program by promoting the notion that graduates will be able to take out mass shooters, there is no evidence that concealed carry is an effective deterrent to public mass shootings.